Summary: It all began when Traveller looked at my darling Maedhros the wrong way. Nothing would have happened if she had heeded my threats. In defense, I have assembled what forces were necessary to take on… dun dun dun… KILLER Tooks! That’s right folks—Merry and Pippin have constructed a Trojan Bunny supplied with the deadly Ammo of…Herbal Essences Shampoo Bottles. Witness the battle between Ar-feiniel and Traveller for Lindt’s Chocolate, bragging rights as Ruler of Himring, a free dinner at the Prancing Pony, and Maedhros’ signature. Summary: Frodo discovers the fun of kissing lasses. Summary: Years after the War of the Ring, when all of the hobbits have left the Shire, a young Ranger discovers the secrets of Bag End when driven in there by need. Summary: A song for the fellowship in my story 'An Elvish War' It was originally put into the story, but it's one of my favorite songs so I thought it ought to have it's own page. The March warden of Lorien was never the proud and cold elf that he is now. An unexpected discovery scarred him forever, turning his heart into stone. Never again did he trust nor believed in the affairs of the heart. Calavénë was the lady in waiting for Lady Galadriel. Her stature and purity were her pride and glory. She lost her heart to him through an unexpected twist of fate. What will it take for Calavénë to convince Haldir of her love? What will Haldir make her wager in return for his trust? 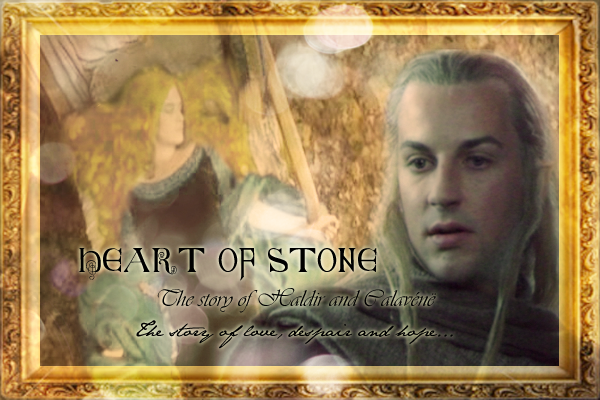 This is Heart of Stone, the story of Haldir and Calavénë. Summary: In which Merry and Pippin test their pick-pocketing skills in order to satisfy Pippin's hunger. Written for Wind Rider's 100 Prompts Challenge #67: A Failed Attempt. Summary: After Gandalf has left with Pippin to Minas Tirith, Merry thinks about being apart from his best friend now. He is not sure how to go on because with Pippin some of his own strength has gone. Summary: An angsty, dramatic poem narrated by - guess who! Summary: Brunhilde, princess of Iceland is brought to Middle Earth and finds herself in the company of two Hobbits and a band Uruk-hai. Trouble seems to be around every corner for the seventeen year old, especially when she meets Eomer, Third Marshall of the Riddermark. Summary: Being at once the One True and Unabridged Story of the Council of Elrond. Humor. Irreverent, Smutty and warnings for cliches and over-used metaphors. Summary: Merry's thoughts when he was captured by orcs. Summary: I quickly obliged shooting up of the ground, my voice came out shaky and scared, "Um I um...I cant...I mean I don't know... Well I cant remember my name and why I'm here - Please don't kill me!" I pleaded at the end and instantly scolded myself. I had just made myself weak, wait I had just admitted to my weakness. A feint hope that I may have been a warrior glimmered through my body. I could hear voice's murmuring, then "Stay there two of us are coming out to get you". Summary: Orphaned, thanks to an orc attack, a young Rohan child rides off in the distance. Abandoned by her horse in Lothlorien, she is helpless and alone until Haldir and his band find her. Raised by Haldir, she grows up well versed in weaponry. But will the heart of a woman and skill with battle be enough to save her friends? Summary: For Ã‰owyn death was easy, surviving; on the other hand, was proving to be the greatest challenge of her life. The road back from the Darkness was longer and harder than she ever imagined. Did she really possess the strength and courage to step once more into the Light? Summary: New chapter: "Lie Down in the Darkness." This is a VERY dark AU for LOTR. The premise: without Gollum, how does the Quest turn out? Angsty drama ensues as the storyline of the Lord of the Rings unfolds differently as we attempt to take "the road less traveled by." Features Frodo, Sam, Pippin, Merry, Boromir, Aragorn, Legolas, Gimli, Gandalf, Arwen, Eomer, Eowyn, Theoden, Faramir, and others. If you would like to be notified when this story is updated, please contact me using the form e-mail on this site. Summary: Sequel to Life Unknown. Ithilwen continues her journey to find out more about who she is while helping members of the fellowship save Middle Earth. She will learn more of her past, about her gifts, and the love she has for Legolas. (Please read Life Unknown before you read this) 10th Mem. Story Rated M for future events and relationship developments. Summary: Ithilwen is lost, orphaned, and alone. After being chased by Orcs and found by a small group of elves, this woman of Gondor must learn her true identify and past to be able to figure out her future. Her journey will take her with the fellowship as they fight to destroy the One Ring and also into the arms of an elf. Tenth Member Story. Rated NC-17 for future chapters.